Prince Fielder won the derby with twenty-eight total home runs, four of which were the longest hit by any batter. He and Ken Griffey, Jr. are the only players to have won multiple derbies. Robinson Cano failed to hit any, which I enjoyed. The National League somehow managed to win its third straight All-Star Game by a most embarrassing and humiliating score of eight-zip. How that was even possible, I have no idea. The American League seriously needs to step it up. Fortunately it wasn’t the biggest run difference in the history of the All-Star Game. The American League earned that when it beat the National League, 12-0, in 1946 at Fenway, of course. They scored five runs in the first thanks to a two-run home run, a bases-clearing triple hit with the bases loaded, and an RBI single. You can thank Justin Verlander for those; each of the American League pitchers pitched only one inning, but clearly his inning was by far the worst, ironically enough. Why couldn’t he pitch like that when we’ve had to face him? He’s the third pitcher to give up at least five runs in at most one inning and the first to do it since 1983. The last time an inning like this happened was in 2004, that most illustrious year, when the AL lit up the NL for six runs in the first. They scored another three runs in the fourth thanks to an RBI single and another two-run home run. You can thank Matt Harrison for those. The AL posted six hits to the NL’s ten, none of which were for extra bases. The AL also went 0 for 7 with runners in scoring position and left eight on base. 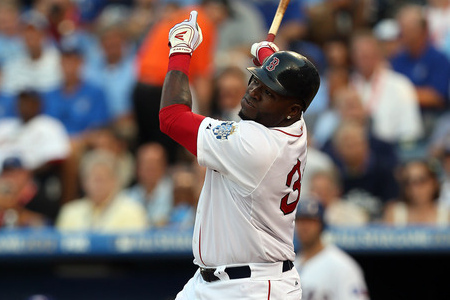 Nobody had a multi-hit performance, but at least Papi didn’t go hitless; he went one for two. The entire team worked only three walks. Melky Cabrera won the Ted Williams Most Valuable Player Award, and Ron Washington is the second manager to lose two straight World Series as well as two straight All-Star Games at the same time with the same teams. Lastly, let it be stated here that the 2012 All-Star Game should have been held in the only ballpark that should have been the only logical choice in the first place: America’s Most Beloved Ballpark. Fenway Park turned one hundred years old this year and deserved to celebrate by hosting the All-Star Game. It’s been long enough since we last hosted one, and the fact that the ballpark is small shouldn’t have entered into it. The team, the brass, the city, and the fans deserved it. What’s done is done, but I’m just saying. Papi and Gonzalez went head-to-head in the Home Run Derby, but neither of them walked away with the trophy. Papi actually didn’t do so well; he hit five dingers in the first round and four in the semifinals, so he was eliminated and never made it to the finals. Gonzalez hit nine dingers in the first round, eleven in the semifinals, and tied a derby record of eleven in the final round that Papi set last year when he won the derby with thirty-two total. It looked like the stage was set for a victory. Even the park was cooperating; Gonzalez has only hit more home runs at his former home park in San Diego. But Robinson Cano hit eight, twelve, and set a new derby record with twelve in the final round and therefore managed to beat him by one. One! That is frustrating. As far as the All-Star Game is concerned, that didn’t have a great outcome either. The American League lost, 5-1. I mean, come on. If we have to lose, at least put up a fight. At least lose by only one run or, even better, tie it and force extras and rise to the occasion. That’s what the National League has been doing for the past few All-Star Games. The American league went two for five with runners in scoring position; the National League went three for eight. The American League left six men on base; the National League left three. The American League had six hits; the National League had nine. The difference-maker was Prince Fielder’s three-run shot in the fourth; CJ Wilson gave that up. After that, there was an RBI single in the fifth and an RBI double in the seventh. We had nothing to do with that. Beckett ended up pulling out due to soreness in his left knee. He says it’s a minor thing and expects to start Sunday. It takes a big man and an even bigger team player to pull out of the All-Star Game so he can make his scheduled start with his team. In two at-bats, Ellsbury struck out twice. In one at-bat, Youk singled. In two at-bats, Papi struck out once. Gonzalez was a different story. Adrian Gonzalez is the reason why the American League wasn’t shut out. He went yard off of Cliff Lee on the second pitch of his first at-bat of the game with two out in the fourth inning, a cut fastball. It was a hugely powerful swing that ended up in the first few rows of seats in right center field. It was the first home run hit in an All-Star Game since JD Drew’s blast in 2008. It’s funny; that home run didn’t make the American League win the game, so if he’d hit it in the derby instead of in the game, he would’ve forced a tiebreaker with Cano and maybe carried home the trophy after all. Well, it’s not like we didn’t try to secure home field advantage for ourselves. It just goes to show you that, if you want something done right, you have to do it yourself. I can’t speak for anyone else. None of our pitchers played in the game so the National League’s runs were not our fault. Did I expect our guys to make a bigger impact at the plate? Yes, but I also expected everyone else on the team to chip in. After all, it is the All-Star Game. All-stars appear in All-Star Games because they’re supposed to be the best of the best. I guess that goes for both sides, but if it’s the American League versus the National League, the American League should at least be giving the National League a run for its money every time. Well, I guess come October we’ll just have to boost our away game. But you have to get there first. Let’s see what happens in the second half. Things did not start out too well for either pitcher. We threatened in the first; Ellsbury was hit by a pitch and Pedroia singled. (Despite the fact that Ellsbury has taken some bumps and bruises lately, he’s still fine.) Then CC Sabathia put up three consecutive swinging strikes. Similarly, Beckett allowed two consecutive singles before securing two swinging strikes and a groundout. Both Sabathia and Beckett settled down after that; nobody scored until the fifth. With the bases loaded, Ellsbury smacked a double that brought in two. That was it until the seventh, when we put up a four-spot. Cameron led off the inning with a walk and scored on a single by Tek. Two batters later, Pedroia singled and Gonzalez walloped a massive three-run shot into the seats behind the bullpen in right field. It was a high fastball, and he had that ball’s number right from the beginning. It was a blast to watch, both literally and figuratively. He assumed his stance earlier, so he had more space over the plate. By doing so, he had more room on the inside, which mean that Sabathia couldn’t pitch inside, which he had been wont to do with lefties. Gonzalez has now hit five home runs in four consecutive games. His longest home run streak, which he two years ago today, is five. Coincidence? I think not. It was his ninth of the season and eighth this month. Even with two out, that pitch never stood a chance. He is just on fire. Right now, I would say he’s probably the hitter to beat in all of Major League Baseball. You would never have known it from his two at-bats before that, but he smoked that ball all the way. And that was the final score right there. 6-0. We win. 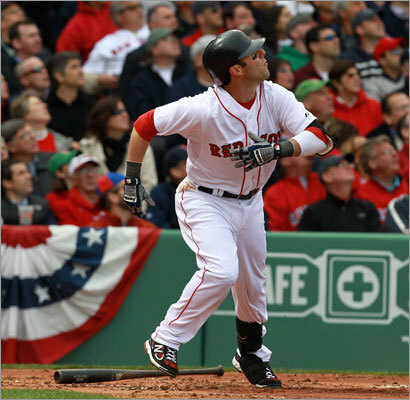 Ellsbury went two for four; Pedroia went three for four with a steal. Joe Girardi was ejected, and Jorge Posada took a mental health day that may or may not have coincided with a bad back day yesterday. He claimed it had nothing to do with the fact that he was dropped to the number nine spot. Oh, the drama. So obviously the other really awesome part of the game was that zero. Beckett was phenomenal. Six shutout innings. Four hits, two walks, nine strikeouts. (Incidentally, he also struck out nine during the complete game he pitched in the 2003 World Series, also against the Yankees. Coincidence? I think not.) 105 pitches, sixty-five for strikes. He wasn’t able to use the two-seam as effectively as he wanted to, especially against lefties, but he worked a filthy changeup, and his cutter and four-seam were comparably unhittable. He even threw in some nasty curveballs. But that changeup and that cutter were just absolutely filthy. He may have thrown twenty-one pitches in his first inning, but he threw only nine in his last. As I said, he notched two K’s in the first, the last of which was a three-pitch strikeout of Robinson Cano put away with the changeup. His second inning was one-two-three but he didn’t strike out anybody. He notched two more swinging strikeouts in the third to open and end the inning, both ending with cutters. The fourth was also one-two-three and featured back-to-back K’s, the first a swing and a miss on a cutter and the second a called strikeout on a cutter. The fifth opened and ended with two five-pitch swinging strikeouts, the first on the curveball and the second on the changeup. The sixth was one-two-three and began when A-Rod struck out on a cutter. Beckett just mowed through the lineup. He was dominant. He was not somebody you wanted to mess with. The Yankee lineup didn’t mess with him. He got the win. The only complaint anyone could possibly have with his outing is that he was slightly inefficient; had his work been more streamlined, he could have pitched at least another inning. But in his two starts against New York this year, he has pitched fourteen shutout innings, given up only six hits, and struck out nineteen batters. In general, he is currently nursing a shutout streak of eighteen and a third innings. And his ERA is 1.75. It doesn’t get much better than that. Albers pitched the seventh and eighth. Hill pitched the ninth. Done. That was awesome. It was just awesome. We did everything the Yankees didn’t. We manufactured runs. We hit for power. We also just out-pitched them completely. So it’s pretty simple. The worst we can do now is win the series. But obviously what we really want to do is sweep. The way the pitching matchups worked out, I’d say that’s a good possibility. In other news, the Bruins dropped the first game of the series with the Lightning, 5-2. Ouch. The phrase “that’s more like it” came to mind last night in every baseball sense with the exception of one. We all know what that one was; more on that later. Meanwhile, there were plenty of positives to go around before we got there. Let’s start with Buchholz. Buchholz delivered his best start of the season when it mattered most. He kept us in it and started this series right. He used every one of his pitches. Okay, so his curveball wasn’t as effective as you’d think it would be for such a good outing. But although his fastballs were thrown for strikes only about half the time, they were thrown for strikes nonetheless and had plenty of good movement on them. And his cutter actually had some life to it, which is way more than we could say about his previous starts. His cutter and changeup were extremely, extremely effective. No matter how effective or how ineffective a particular pitch was overall, in true Buchholz fashion he wasn’t afraid to go to any pitch in any count and throw it for a strike. This is the third consecutive start he’s won, but that’s really how you know he’s back. Essentially, he cruised. All told, he pitched through seven innings. He allowed two runs on five hits while walking only one and striking out a season high seven. He threw 110 pitches, sixty-five for strikes. And finally, the paradoxical mark of a fantastic outing: those two runs were both allowed on a homer by Russell Martin in the fifth inning on the first pitch of the at-bat, one of the few cutters that didn’t cut. Otherwise, everything was totally fine. Buchholz enjoyed a one-two-three inning in the first that included two back-to-back strikeouts; first, Derek Jeter swung and missed on a fastball, and then Curtis Granderson swung and missed on a curveball. 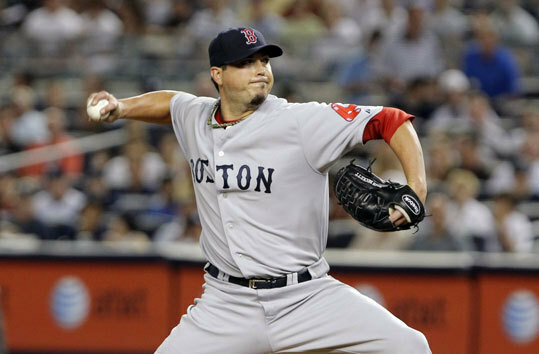 Buchholz opened the second by striking out A-Rod, who swung and missed on a cutter. He struck out Granderson on three pitches to end the third, featuring a changeup followed by a cutter and then another changeup that induced a swing and a miss. (The third inning should have been one-two-three, but Jeter reached on a fielding error by Youk before that K. The ball looked like it would be a routine grounder to third, but it bounced off Youk’s hand. Luckily, he’s okay.) Nick Swisher struck out by swinging and missing on a cutter to end the fourth. Mark Teixeira struck out by swinging and missing on a changeup to end the fifth, Buchholz’s longest inning at twenty pitches. The sixth was the only frame in which Buccholz did not notch a single K. Buchholz ended his outing with another one-two-three inning that started with his only called strike of the night, which he achieved using a changeup with which Martin could do absolutely nothing. Martin’s home run actually tied the game at two. In the fourth, Gonzalez led off with a solo shot. First he took a ninety-one-mile-per-hour four-seam up and away for a ball; then he took a ninety-one-mile-per-hour four-seam up and straight down the middle out of the yard and into the first few rows of the second deck of seats in right field. So was I annoyed when they intentionally walked him in the ninth to get to Youk? Obviously. Speaking of Youk, he walked later in the inning and scored on a groundout by Crawford. We secured some insurance in the seventh. Ellsbury singled, stole second, moved to third on a single by Pedroia, and scored on a sac fly by Gonzalez. With Pedroia on base and two out, Youk unleashed on a fourth-pitch fastball at ninety-eight and also sent it to right field. Clearly, everyone felt pretty good going into the eighth, especially with Bard coming up. Wrong. It seems like, when you feel most at ease and most secure with the lead and you feel most confident in Bard to protect it, he lets you down. He hadn’t pitched in three days; he needed the time off, but even when you need time off, sometimes it still messes with you. Granderson led off the inning with a triple. Then Teixeira popped out, and after that Bard lost all sense of the strike zone. Granderson scored on a wild pitch to bring the Yankees within two. Then A-Rod walked, Robinson Cano was hit by a pitch, and finally the inning was over with a strikeout and a groundout. Crisis averted but not yet defeated. Paps came on in the ninth; by that time, Bard had already put me on edge, so I wasn’t as surprised when, after Martin struck out swinging and Brett Gardner grounded out, Jeter singled, took second on defensive indifference, and scored on a single by Granderson to bring the Yankees within one. Finally, Teixeira popped up on his first and only pitch of the at-bat. Paps recorded his first save since April 22, ending the longest stretch of his career without one at twenty days. The game was over, 5-4. That was immensely satisfying. Not only did we beat the Yankees, but we beat them by not only besting their starting pitching and hitting but also by putting down two late-inning comebacks. Just a few days ago we came back three times and lost. We know how crushing that is. It’s bitter medicine indeed. So, yes, I was furious with Bard and Paps that they even put us in that position. But you also have to admit it was nice to crush those rallies. So the offense took care of business, Buchholz reigned supreme, and the relievers who are supposed to be the best of the best of the bullpen almost lost the game for us. If you think about it, we haven’t had that many games this season where everything, the hitting and starting pitching and relief and fielding, went right. But even with the rocky relief, I’ll take a win over New York any day. A win today wins us the series, so let’s do it again. Turns out it wasn’t too much to ask after all. Home. Home is where the heart is. Home is also where the wins are. Yesterday was the first day of the rest of our 2011 baseball lives. The Opening Ceremonies, as always, were very well done. From the team introductions to the national anthem to the F16 flyover to paying respects to Lou Gorman to watching Yaz throw out the first pitch, it really gave you a sense of how far our storied team has come, and it reminded you of why we love this game and this team in the first place. It really did feel like we started the season yesterday and every game we played before that was still part of Spring Training. By the way, we have won every game before which Yaz has thrown out the first pitch. So maybe that’s something to keep in mind if we have another losing streak. Either way, before the game even started, you could smell the win in the air. We completed the Year X Improvements project this winter. Offseason additions to the park include expanded concessions and souvenir options, three Mitsubishi Electric Diamond Vision high definition LED screens, more concourse TVS, a new ticket booth at Gate D, and general repairs in the seating area. All of the construction and repairs were green, using recycled materials and such. The bad news? One of the LED screens, which is absolutely huge, replaced the John Hancock jumbotron in center field. That jumbotron may have been old, but that’s where multiple generations of Red Sox fans looked when they couldn’t believe what they were seeing. That jumbotron projected a world of badness and a world of greatness. I guess the only solution is to inaugurate the new one with a World Series win. I have to say that everything looks fantastic. Major improvements have been made during the offseason for the last ten years, and yet every year it looks like nothing has changed at all. They’ve done a brilliant job working with the park and integrating everything. It looks awesome. We entered the game after having made some changes. Matt Albers is on the fifteen-day DL with a strained right lat muscle, so we recalled Alfredo Aceves. We also designated Reyes for assignment and activated Felix Doubront. We batted Crawford in leadoff, moved everyone up, and inserted Ellsbury into the eighth spot in the lineup. So then the game starts. Lackey’s first pitch was a strike to Brett Gardner in an at-bat that quickly turned into a leadoff walk. And you could just tell that he wasn’t on. Sure enough, with two out in the first, A-Rod walked, and when Cano doubled to center field, two runs were in. 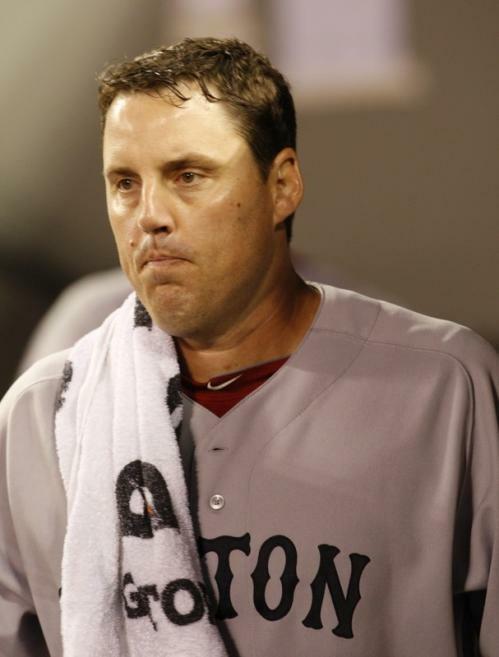 The Evil Empire would score a run in each of the next four innings until Lackey was removed. He failed to hold a single lead. So he pitched five innings, gave up six runs on seven hits, walked two, and struck out two. He gave up a home run to A-Rod of all people. He threw ninety-one pitches, fifty-one for strikes. He threw mostly curveballs and cutters, the former being more effective than the latter. He threw all of his off-speed pitches for strikes at least fifty percent of the time. His cut fastball was particularly nasty, topping out at ninety-four miles per hour. But his straight-up fastballs were not effective. Luckily, he got in on their hands and pitched inside, and he kept his per-inning pitch counts low, going up to twenty-two in the first and again in the fourth at the highest. His last inning was also his best; he threw twelve pitches, eight for strikes. Pedroia, as he is wont to do, got the entire team going. He smacked a huge solo shot into the first two rows of the Monster about ten feet to the right of the Fisk pole in the first inning, cutting our deficit in half. It was a curveball that didn’t curve. He literally swung that bat with his entire body. He did whatever it took to get that ball out, and Red Sox Nation sighed in relief as one. After a losing streak like ours to begin the season, the longer you go without some sort of definitive offensive display, the harder it is to get one going. I knew going into this game that if we didn’t do something, anything, early, it would be that much more difficult to do it in the later innings. That home run was exactly what we needed. After the Yankees tied it back up, we let loose with our best and biggest inning of the season to date. Five runs in the second. We tied our highest run total for an entire game so far in that single frame. I was so unused to seeing hits being strung together, I almost felt like I was witnessing some sort of mythical feat. Scutaro grounded into a fielder’s choice that scored one run. Pedroia singled in two more and moved to second on a fielding error. Gonzalez singled him in. And Papi singled him in. What you just witnessed was our first run manufacture of 2011. And that, my friends, was the end of Phil Hughes. Bartolo Colon came on after that and shut us down until the seventh. By that time, the Yankees had tied the game. And who should come through but Salty, who doubled in Youk after Papi failed to be called out thanks to another fielding error, and that established a lead that would stand permanently. After that, Girardi lifted Colon in favor of Boone Logan because Papi and Drew, back-to-back lefties, were coming up. In a fine display of hitting and reassurance that our lefty-heavy lineup can’t be shut down by a simple call to the bullpen, it made absolutely no difference. They both came through. Drew ended up singling in Gonzalez and Papi. Where Lackey failed, the bullpen didn’t. Our relievers shut down the Yanks for the last four innings. We had one effective shutout frame each, each worth a hold, from Aceves, Jenks, and even Bard. Bard and Paps each threw eleven pitches, eight for strikes. Paps registered his first save of the season in the ninth. They mowed them down like grass, overgrown and overblown. In total, we amassed twelve hits. Double digits. Five members of our lineup had multi-hit games; Salty, Drew, and Papi each went two for four while Gonzalez went two for five and Pedroia, the man of the hour, went three for five. We left six on base and went six for ten with runners in scoring position, which means that we put runners in scoring position and then brought them home. The best part? We scored nine runs. Nine to their six. That’s what it feels like to have the offense back the pitcher. That’s what it feels like to score a sufficient amount of runs in order to deal with it if the pitcher has an off day. Cue “Dirty Water.” Ladies and gentlemen, we are now one and six! This was our hundredth home opener, and we have now won seven straight. With the frustrating exception of Lackey, we were absolutely brilliant in every way. The hitters were hitting. The fielders were fielding. (With the second frustrating exception being Crawford, who at one point looked just sad when he couldn’t have been in a worse position to play a ball off the Monster. I can understand that; it’s his first season, and he has to get used to it. It’s not an easy left field to play. It’s just that historically, even as an opponent on a visiting team, he’s always played the wall well. I was surprised.) And the relievers were relieving. Hopefully tomorrow the starter will be starting. Make no mistake, folks: you just witnessed one of the most satisfying wins we’re going to have this year. I repeat: yesterday was the first day of the rest of our 2011 baseball lives. One other thing. Manny Ramirez announced his retirement today. It came after he was told of “an issue” that came up under Major League Baseball’s drug policy. This is not difficult to figure out. He tested positive four years after testing went into effect, was suspended for fifty games, cleaned up, came back, and comparatively speaking he pretty much failed as a hitter. Lately he’s been reduced to being happy with singles. We’re talking a drop in average as well as on-base percentage of upwards of a hundred points. Recently, he failed another drug test; the suspension for a second transgression doubles, so it would be a hundred games, which is two-thirds of a season. Not wanting to deal with that suspension, he retired instead. That’s why it’s always good when a baseball player knows when it’s time to call it quits in every sense. He did wonderful things when he was here in Boston, but we were on the receiving end of some pretty bad ugliness from him as well. He was often funny but never easy. It’s just sad that rather than recognizing when his time was up, he felt so compelled to follow such a course of action. When Curt Schilling started to age, he prolonged his career by converting power to finesse in an incredible show of integrity, strength, and discipline. Manny Ramirez was known throughout baseball for his intense work ethic but inconsistent-at-best personality. Since he first failed four years after testing went into effect, and during those years he still posted numbers worthy of the Hall of Fame, he probably eventually saw the beginnings of a decline due to age and wanted to try to avoid it the bad way. He thought he could play the game by his own rules but got caught when those rules were at odds with everyone else’s. For now that’s all we know, and we’ll just have to wait and see what else happens. Thanks for good memories, good times, and good laughs, Manny. We’ll remember you as you were. There are a couple of reasons why our loss yesterday technically isn’t the end of the world. The first is that we won the first game, so we’re no better off than we were heading into the series, which is good considering it could be worse. The second is that the Rays also lost, so there’s that. Either way, we still lost to the Evil Empire in the Bronx when we needed to win. And I loathed that experience just as much as I enjoyed winning on Friday. Lackey was not helpful. His scouting report always says he’s a big-game pitcher, and Tito always says that on a day he starts we’ll still be in the game in the seventh inning because of him. Technically we were because we were only down by three, but in my book a big-game pitcher and one who keeps you in the game in the seventh inning when you’re the Red Sox and playing the Yankees in the Bronx will either have you with a lead, a tie, or a one-run deficit if that’s true. We had each of those over the course of the game and Lackey couldn’t hold on to any of them. He gave up five runs on eight hits in six innings. He walked three, struck out seven, and took the loss. He threw 116 pitches, sixty-nine of which were strikes. He started the second by giving up a walk and eventually the lead by allowing the bottom half of the order to tie it. He allowed four consecutive two-out hits in the fifth that broke the tie for good, throwing a total of thirty-one pitches in the inning. And may I say that Drew was not helpful either; Cano’s bloop hit fell right in front of him, and I can only assume the sun prevented him from seeing it properly because there’s otherwise no excuse for why he didn’t catch that ball. There was also the throwing error by V-Mart in the sixth that was aimed for Scutaro to prevent the steal of second, but it bounced off Scutaro’s glove and ended up in the outfield, allowing the lead runner to advance to third and eventually to home plate. In the beginning of the game, Lackey threw his fastball more often, but eventually he abandoned that plan because his fastball wasn’t that great. His curveball was his stellar pitch, followed by his changeup and slider. Not coincidentally, his next-most abundant pitch, his cutter, was mediocre. He mixed his pitches well and put good movement on them. But he let the game slip through his fingers. When we play the Yankees, everything has to be working: run prevention as well as run production. Yesterday, we basically had neither. The game began with such promise. We were the first to get on the board when V-Mart hit a solo shot in the second to left, right after FOX’s commentators finished expounding on the fact that V-Mart has lit up lefties this season. The count was 3-1, so he was sitting on an inside fastball, and that’s exactly what he got. It was V-Mart’s first homer in sixty-seven at-bats and couldn’t have come at a better time. Then Beltre extended his hitting streak to thirteen games with a double and scored Lowell’s subsequent double. And that was it for us for the rest of the game. We lost it, 2-5. Sabathia’s velocity was noticeably low, but of course the problem is that when that happens to him, he just switches to finesse. If we won, we could have been four games out of first and three and a half out of the Wild Card. But we didn’t. We lost. And I’ll tell you another thing. Jerry Layne’s strike zone was way too wide. Papi showed a lot of composure out there, because some of those supposed strikes were miles off the plate. And that bothers me. An umpire is supposed to be invisible, and the action of the game is supposed to unfold in front of him. Jerry Layne was very visible, and instead the action was unfolding around him. That’s not good. If he wants to impact the action that much, he should put on a uniform and play, in which case I doubt he’d be very happy with his own strike zone. I should mention that Delcarmen and Doubront were both excellent in relief. I should also mention that we did in fact acquire Delgado. As predicted, we signed him to minor league deal, which he can waive if we don’t put him on the Major League roster by September 1. And last but not least, Ellsbury wasn’t in the lineup today because it was a scheduled day off against a lefty, not because his diving catch on Friday injured him again. Kalish sat for the same reason. But like I said, it could be so much worse, so we should at least be thankful we won the first game, but it just feels like a waste. The day was scripted for a win. The Rays lost, we won the night before, we had a big-game pitcher on the mound who would take us into the seventh inning, V-Mart hits a home run, Lowell bats one in, and then it just stopped. I can’t adequately express my frustration. I mean, it seriously just stopped. Sabathia locked, Lackey unlocked, and that was the end of it. We’re throwing Beckett against Burnett tonight. We need to get this one. The title of this post is both very cheesy and completely unoriginal, but it’s accurate and it gets my point across, so I’m going with it. As usual, I’ll start with the Home Run Derby, and unlike the derbies of previous years, this one actually wasn’t a drag. All I have to say is, “Who’s your papi?” That’s right, ladies and gentlemen. 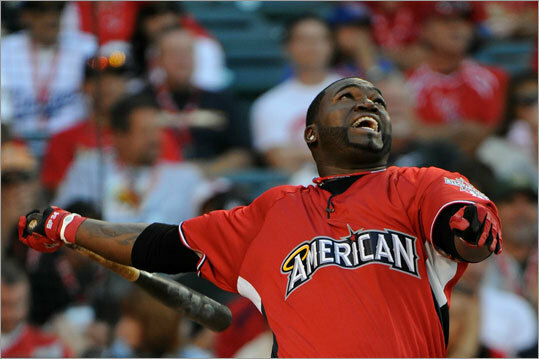 Your newest Home Run Derby champion is none other than David Ortiz himself! I can’t say I was surprised. Big Papi is one of the best, and lefties own that ballpark in the evenings. Eight homers in the first round batting sixth and thirteen in the second leading off said he was tied with Hanley Ramirez, ironically enough, but he left that tie in the dust when he clubbed eleven homers in the final round from the leadoff spot. Ramirez couldn’t even come close. He is the first Red Sox player to win a Home Run Derby, and after everything his home runs have done for this team, he most definitely deserves it. And he sure did us proud. If you want to talk about power, that right there was power. It was home run after home run after home run. Literally. And he’s a classy guy; he even went out to Ramirez during the final round and told him to slow down and save his energy. And of course the dedication of his trophy to Jose Lima. That was special. The game itself was a compete disappointment. The final score was 3-1 in favor of the National League, which snapped its All-Star losing streak at thirteen games. The American League hasn’t lost an All-Star Game since 1996. The National League! Not only did the American League, and by the American League I obviously mean us, lose home field advantage for the World Series, but it also humiliated itself. I mean, who loses to the National League? Sure, the NL put its best out there, but so did the AL. It’s just not right. Jon Lester, I am proud to say, pitched a one-two-three bottom of the sixth and was rewarded with a hold for his services. Because he was pitching with a 1-0 lead at the time. Of the eighteen pitches he fired, eleven were strikes. Ramirez was the first out after he hit a ground ball hard back to the mound. Prado then popped to short. And Gonzalez hit a ground ball to second. Then Phil Hughes allowed two of the runs and took the loss. A Yankee. Great. Matt Thornton of the White Sox got a blown save. The AL scored its only run in the fifth, when Longoria came home on Cano’s sac fly. So representatives from our two rivals scored the only run. Interesting. Papi struck out looking, hit a single, and was left on base once. The contrast from his performance during the Home Run Derby was striking. I mean, it’s supposed to be, but still. That single led off the bottom of the ninth and was halfway to second base on a bloop by Buck when Byrd caught the ball and fired to second to force him out. It was ruled a fielder’s choice. And it was pretty much the end of the game. If it had been anyone faster on the basepaths and anyone less competent in the outfield, the runner would have been safe without a doubt. 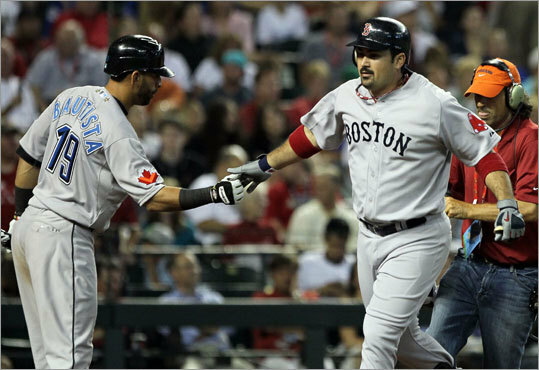 It was the first time in his career that Papi ever faced Broxton. He was actually the pitcher who served up what would become Pedroia’s first career walkoff hit on June 19, and Papi was standing in the on-deck circle at the time. Beltre entered the game in the eighth for defense and struck out swinging in the ninth after Papi’s at-bat. Pedroia, Buchholz, and V-Mart obviously had a blast and took it all in. Although I would like to point out that, had the three of them been able to play, it’s not inconceivable that the American League would’ve won after all. I’m just saying. All three are elites in pitching or batting and defense. So it’s an objectively reasonable claim. So that was it. It was a clean, short, nine-inning game. Kind of boring, actually, as All-Star Games go. No position players had to come in and pitch, no spectacular plays in the field were made, no tie at the very last out was broken by a walkoff, none of that. Just simple baseball. But that’s cool too. We watch baseball for the love of the game, so sometimes simple baseball is just nice. Then again, it’s even nicer when the team we want to win, actually wins. At times like this, it makes you reconsider the concept of fan voting. You’re talking about letting a popularity contest decide something very serious and important: home field advantage for the World Series. Starting the World Series on the road is not ideal, but I’m not worried about our ability to get through it. I’m just saying that it’s a weighty issue that should be given its due consideration.